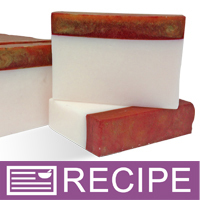 Ripe raspberry, orange zest, and warm musk intermingle in this holiday soap loaf. This project comes with a regular silicone mold; a staple mold for soapmakers that can be used with future projects. You Save $11.35 by purchasing this kit rather than buying the items separately.